Eka pada koundinyasana II (pose dedicated to the sage Koundinya II) is a split-legged arm balance that is sometimes dubbed “flying splits” as it resembles a front split hovering away from the floor. Though this has become a popular transition, for many yogis it's easier said than done. In fact, I remember the first time that this option was presented to me in class (okay, the first several times. At least.) Thoughts of ha! yeah, right! immediately sprang up. 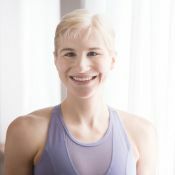 The idea of hovering both of my legs over the floor in something resembling hanumanasana while maintaining “chaturanga arms,” even for a split second (no pun intended), seemed far outside the realm of possibility. And yet, the option kept coming up. And I kept trying, and (eventually) eka pada koundinyasana II started to feel just a little bit less impossible. Still, it wasn't until this pose was really broken down for me, step by step, that “liftoff” occurred. Though this has become a popular transition, for many yogis, it's easier said than done. If you (or your students) are facing similar frustrations with eka pada koundinyasana II, or if you're just looking to more deeply explore and refine your “flying splits,” you might find the following step-by-step breakdown, which approaches the pose from a lunge in lieu of a three-legged dog, to be useful. And while there are certainly those who will prefer the three-legged dog transition, or find it to be easier initially, you may even (like me) discover that after playing with coming into the pose via lunge for a while, incorporating it into your vinyasas (via the three-legged-dog transition) seems a lot more accessible! From three-legged dog, with the right leg lifted, exhale knee to chest (shifting forward almost as if you were coming into plank); inhale three-legged dog; exhale, right knee to upper, outer right arm; inhale, three-legged dog; exhale, cross the knee to the upper left arm; inhale three-legged dog, and repeat. Then, return to downdog, and repeat on the second side. Even if you're not coming into the arm balance this way, this variation (especially the knee to same-side upper arm contact) is a nice way to prepare for the leg-to-arm connection and the forward shift needed for flying splits. Like with many arm balances, maintaining a chaturanga-like arm position is essential for a safe, sustainable eka pada koundinyasana II. As you practice chaturanga, pay special attention to keeping the fronts of your shoulders lifted away from the floor (they should remain as high as, or higher than, your elbows as you lower), and staying broad through your collarbones and chest. The initial flying splits setup described below starts with a lizard variation and moves into a “leg over arm lunge” (sometimes called “airplane lunge” if you extend both of your arms out to the side like “wings”), making poses like these especially useful preps. Poses like these are great for learning to work your leg up over your arm too, and will also help to prepare your hips for eka pada koundinyasana II. ...And other poses that stretch the hamstrings, like utthita hasta padangusthasana, supta padangushthasana, and hanumanasana. This variation provides you with another great way to stretch your hamstrings, and gives you a chance to practice walking your front foot forward at a diagonal (like you will in your peak pose) from a more stable position, making a shape that's likely more similar to the shape you'll make when you're airborne than a traditional split is. Come into a lunge with your right foot forward, and bring both of your hands to the inside of your front foot. Lift your back thigh (especially your back inner thigh) up toward the sky and sink your front thigh down and forward. Stretch your legs apart from each other like you're stretching your mat in two as you reach your chest (not your chin!) forward, leading with the sternum like you would in warrior III, so that the weight of the upper body begins to balance out the weight of the hips. This is where you work your right shoulder under your leg (just like you would for the deep lunge or “airplane lunge” variation mentioned earlier). Some people find it helpful to walk the right foot a little more to the right for this, but personally, I find that walking the foot a little more toward the left (so it's more toward the center of my mat) helps me to feel more stable coming into the pose, and to work my arm under my leg more easily. Experiment with both and see what works best for you. Then, to work your leg under: Lift your right heel up off of the floor (like you're wearing a shoe with a high heel); bring your right hand to the back of your calf, and lift the flesh of your calf up. Then move your right thigh back (out toward the right) to make space to work your shoulder under. Continue to work these actions: calf up, thigh back, shoulder under, until you get to the point where your shoulder is as “under” as it's going to get! Once you've worked your arm under your leg, lower your right heel back down, and plant your hands on the floor (on either side of your front leg; think chaturanga arms here). Broaden through your collarbones and lift the fronts of your shoulders up away from the floor. Start to walk your right foot forward at a diagonal, toward the upper right corner of your mat. Then, lift your right heel up off of the floor, and see if you can inch your right foot forward (at that same diagonal) a little more. Then, see if you can spread your toes and lift your entire foot up off of the floor! Keep your elbows bent, your collarbones broad, and your gaze slightly forward. With your right foot lifted and your right leg extended, start to shift your weight a little more forward to come high up onto your left toes (keep your collarbones broad and maintain chaturanga arms), and, using your toes like a lever or a seesaw, shift your shoulders and chest forward, and see if you can lift your back foot off of the floor too. You'll have to “negotiate” your weight as you shift forward and back a bit, perhaps eventually finding the “sweet spot” where both feet can hover away from the floor. Until then, hopping up and down on your back foot is totally fine! Keep the fronts of your shoulders lifted, level, and not dipping below your elbows. Spread your toes and stretch out through both legs with your gaze slightly forward. Return your back foot to the floor, then step back to downward facing dog. Take a few resting breaths, then repeat on the other side. Don't be surprised if one side differs wildly from the other! Once I learned to hover both legs off the floor on the right side, it took an entire year before I could do the same thing on the left side! If you too discover that one side is considerably more challenging than the other, try starting with your “harder” side the next time that you practice this pose. This can help to ensure that you spend just as much time (if not a little more) on the side that could use a little more attention. Balance out your practice with a few favorite backbends, like shalabhasana (locust) variations, dhanurasana (bow pose), setu bandha (bridge pose), or urdhva dhanurasna (upward facing bow/wheel). From there choose one or two grounding finishing poses, like a simple forward bend variation of pigeon, or a figure four stretch before settling into a blissful shavasana!